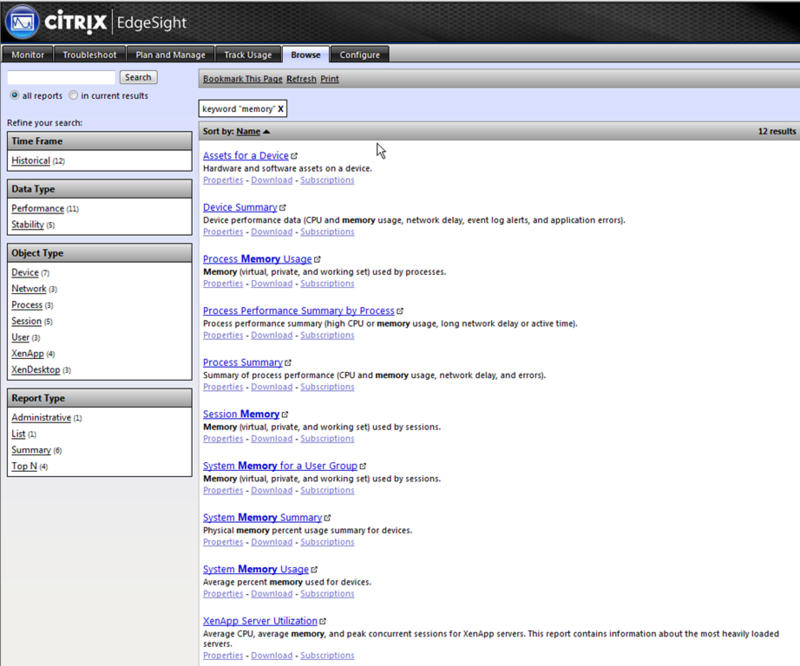 In my experience, EdgeSight is not typically deployed in XenApp environments. 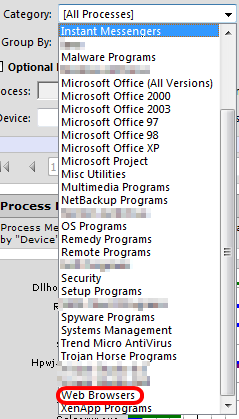 The reasons for this are many including, it seems redundant and overlaps with an already installed solution, it’s hard to use (sorry Citrix, this is a great tool, but it almost requires a dedicated resource to manage it), most XenApp administrators/managers do not know why or how it should be used, and finally you need a platinum license in order to run the agent in advanced mode which is a deal-breaker for some companies. In this post, I will cover a use case for EdgeSight that measures memory utilization of IE after a registry change is made. Trond Eirik Haavarstein at XenAppBlog wrote a 2-part series on running Internet Explorer 7 or 8 in a terminal server environment and its impact on memory utilization. He shows how memory is used by multiple tabs in IE and references an MSDN Blog about a registry change that will modify the Tab Process Growth. Any XenApp/Terminal Services environment is an exercise in resource management so we wanted to apply this change in our staging environment (prior to applying it in production) to determine if it will have a positive impact. 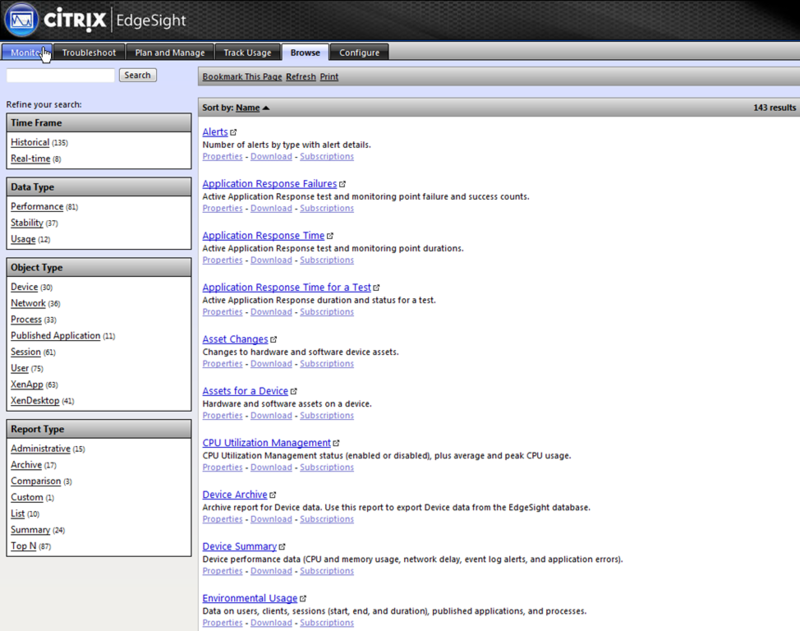 EdgeSight – Oh I get it! 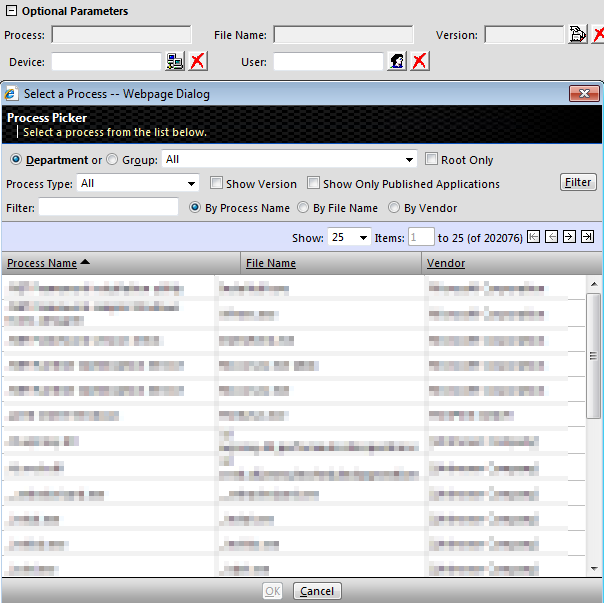 After applying the registry change via a GPO, we waited a few days in order to gather enough data in EdgeSight to make a before/after comparison. Now we will walk through selecting the report we need and running it with the correct criteria. You can see that you can narrow your choices in a couple of different ways. The report we need is the Process Memory Usage. Let’s click on this report and see what the default result is. We can first choose to limit the Department to just our XenApp servers where we made the registry change. Next we can hit the Category drop down and select Web Browsers. 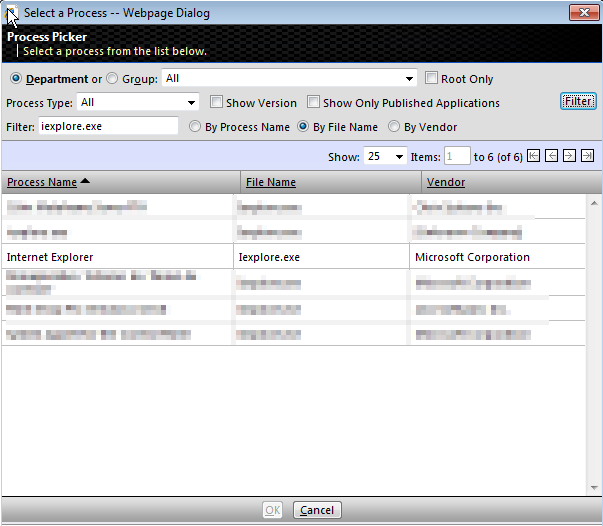 Select it and click Ok. Now Internet Explorer is the selected process in the Optional Parameters section. Clicking on Go will show us the top 20 instances of Internet Explorer’s usage of Virtual, Private, and Working Set memory over the period of 3/22 to 3/29. For a detailed explanation of memory, I would refer to Mark Russinovich’s blog post here. Now it’s a matter of selecting the correct dates and comparing the results to show how the change we made has positively impacted IE memory usage. 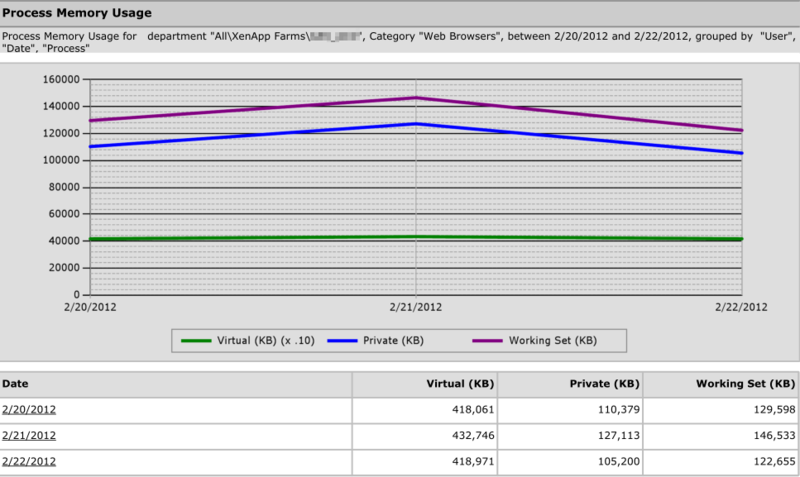 I found that the IE memory footprint was reduced by 10,000 – 30,000 kb after applying the registry change. 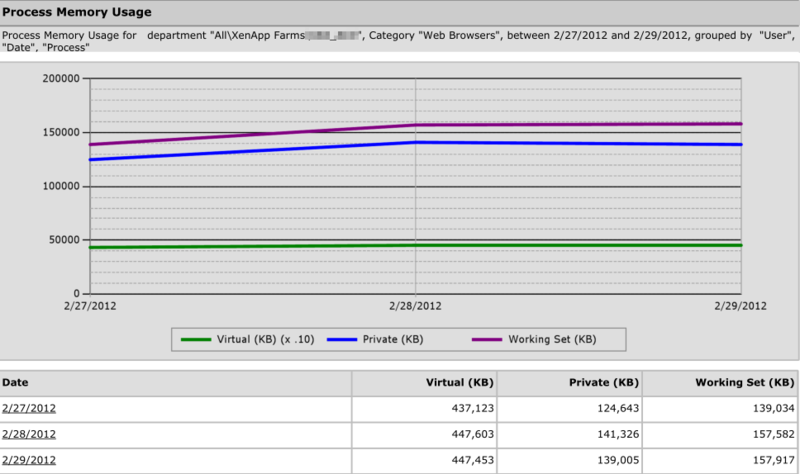 That works out to around 10-30 MB per user which isn’t too bad in shared environment. 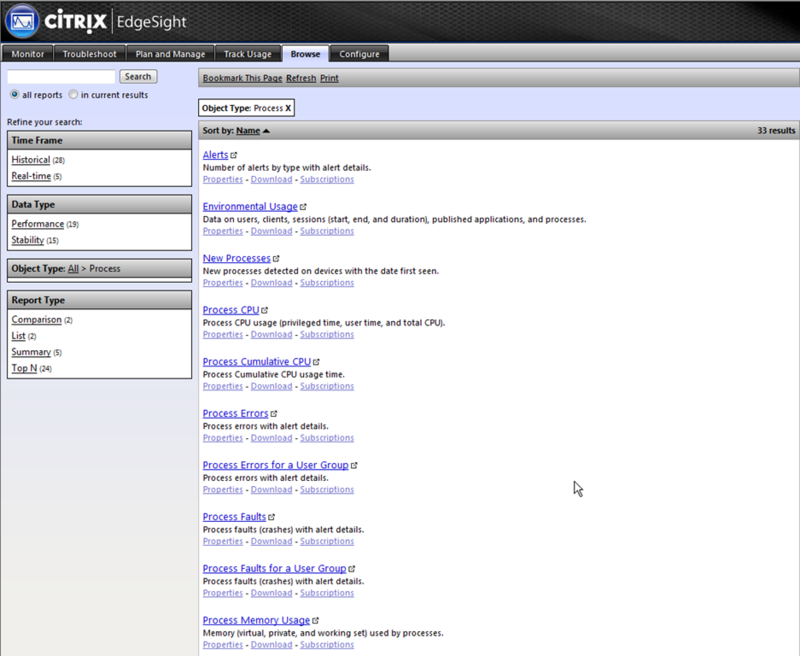 Nice article about Edgesight – I’m one of those Citrix admins that still laments the demise of Resource Manager. I don’t want to rain on your parade, but judging by the dates in the screenshots, it appears your ‘before’ and ‘after’ charts are transposed. So memory utilisation went up? How did it pan out in production? Thanks for bringing this to my attention. It appears one of my image links was broken. I’ve reinserted the image and the before and after images should make sense.